We are offering beautiful stone jewellery to our client at affordable price.These are the most beautiful jewellery which look very stunning with its design and handmade work. Perfectly styled for party wear attire to look beautiful. Make your Life's special moments unforgettable with this range of designer stones jewellery. 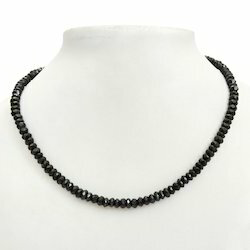 This necklace comprises special black spinel stones. It is a perfect accessory to go along with any kind of ensemble on all occasions. This vibrant Necklace is traditionally designed and handcrafted. This intricate work alluring jewellery is unavoidably attractive. This is delecately made, displays a fine shine and can be worn with Indian as well as Western outfits. Adorn this beautiful jewellery creation to give yourself a graceful look. It will surely enchant any female mind. Packaging Details: The product will be packed safely. Make your Life special moments unforgettable with this range of designer stones jewellery. This Brown and Turquoise Necklace set. The bunch arrangement of the multiple Brown beads makes it charming. Kundan work on the white pearls enhances its beauty. The necklace has S-hook closing and comes with two matching earrings too. Perfect accessory to go along with any kind of ensemble on all occasions. This vibrant Necklace is traditionally designed and handcrafted. It can be worn with Indian as well as Western outfits. Adorn this beautiful jewellery creation to give yourself a graceful look. It will surely enchant any female mind. 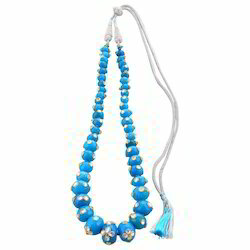 This multicolor beautiful necklace comes in mala style which has various uncut Multi-stones like Cetrin, Iolite, Aqua Marine, Garnet and Peridot in continuation to make a lavishing mala style necklace. It is a Perfect accessory to go along with any kind of ensemble on all occasions. This vibrant Necklace is traditionally designed and handcrafted. This intricate work alluring jewellery is unavoidably attractive. This is delecately made, displays a fine shine and can be worn with Indian as well as Western outfits. Adorn this beautiful jewellery creation to give yourself a graceful look. It will surely enchant any female mind. Make your Life's special moments unforgettable with this range of designer stones jewellery. 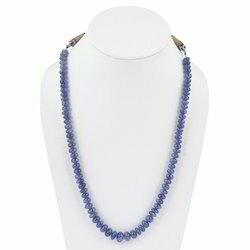 This is a fine necklace of 275 carats Tanzanite stone in Royal blue color with Oval style beads arrangement. 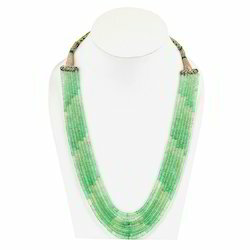 The necklace also has a size adjusting sarafa which comes with the matching colour as the beads. It will be a perfect accessory to go along with any kind of ensemble on all occasions. This vibrant Necklace is traditionally designed and handcrafted. This intricate work alluring jewellery is unavoidably attractive. This is delecately made, displays a fine shine and can be worn with Indian as well as Western outfits. Adorn this beautiful jewellery creation to give yourself a graceful look. It will surely enchant any female mind. 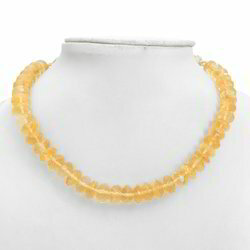 Clinch the attention of the crowd by wearing this 145 carats Yellow citrine stones necklace. The transparency and baati cut faceted design makes this even more attractive. The necklace has a size adjusting sarafa which comes with the matching colour as the beads. Perfect accessory to go along with any kind of ensemble on all occasions. This vibrant Necklace is traditionally designed and handcrafted. This intricate work alluring jewellery is unavoidably attractive. This is delecately made, displays a fine shine and can be worn with Indian as well as Western outfits. Adorn this beautiful jewellery creation to give yourself a graceful look. It will surely enchant any female mind. 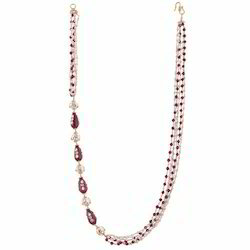 Clinch the attention of the crowd by wearing this uncut Garnet and Amethyst combination rope mala necklace. It is a perfect accessory to go along with any kind of ensemble on all occasions. This vibrant Necklace is traditionally designed and handcrafted. This intricate work alluring jewellery is unavoidably attractive. This is delecately made, displays a fine shine and can be worn with Indian as well as Western outfits. Adorn this beautiful jewellery creation to give yourself a graceful look. It will surely enchant any female mind. Presenting this exciting range of necklace which comprises amazing aqua marine stones in fabulous aqua blue color. The lobster claw closing makes this necklace even more special. It is a perfect accessory to go along with any kind of ensemble on all occasions. This vibrant Necklace is traditionally designed and handcrafted. This intricate work alluring jewellery is unavoidably attractive. This is delecately made, displays a fine shine and can be worn with Indian as well as Western outfits. Adorn this beautiful jewellery creation to give yourself a graceful look. It will surely enchant any female mind. Flatter your loved one senses with this exciting range of kundan-pearl necklace. This simple and sober necklace is a perfect accessory to go along with any kind of ensemble on all occasions. S-hook closing enhances its comfortability. This vibrant Necklace is traditionally designed and handcrafted. The set possesses the two matching earrings too. The Radha-Krishn art is this set uniqueness. This is delecately made, displays a fine shine and can be worn with Indian as well as Western outfits. Adorn this beautiful jewellery creation to give yourself a graceful look. It will surely enchant any female mind. Clinch the attention of the crowd by wearing this exciting necklace. 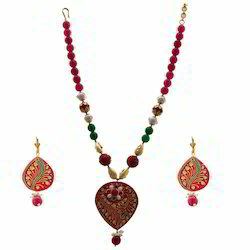 This necklace has golden color meenakari Red balls arrangement with sarafa closing. It is a perfect accessory to go along with any kind of ensemble on all occasions. This vibrant Necklace is traditionally designed and handcrafted. This intricate work alluring jewellery is unavoidably attractive. The set comes with two matching earrings too. This is delecately made, displays a fine shine and can be worn with Indian as well as Western outfits. Adorn this beautiful jewellery creation to give yourself a graceful look. It will surely enchant any female mind. Make your Life special moments unforgettable with this range of designer jewellery. 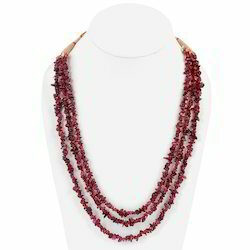 This is a fine necklace chain of Maroon-Green color beads arrangement with the brass chain in the middle. It will be a perfect accessory to go along with any kind of ensemble on all occasions. This vibrant Necklace is traditionally designed and handcrafted. This intricate work alluring jewellery is unavoidably attractive. This is delecately made, displays a fine shine and can be worn with Indian as well as Western outfits. Adorn this beautiful jewellery creation to give yourself a graceful look. It will surely enchant any female mind. Presenting this exciting range of necklace which comprises amazing almond shape chalcedony chinese pearls arrangement in fabulous Red and White combination. The polki design with six designer lines make this necklace even more special. It is a perfect accessory to go along with any kind of ensemble on all occasions. This vibrant Necklace is traditionally designed and handcrafted. This intricate work alluring jewellery is unavoidably attractive. This is delecately made, displays a fine shine and can be worn with Indian as well as Western outfits. Adorn this beautiful jewellery creation to give yourself a graceful look. It will surely enchant any female mind. Make your Life special moments unforgettable with this necklace that has golden color meenakari Turquoise balls arrangement with sarafa closing. It is a perfect accessory to go along with any kind of ensemble on all occasions. This vibrant Necklace is traditionally designed and handcrafted. This intricate work alluring jewellery is unavoidably attractive. The set comes with two matching earrings too. This is delecately made, displays a fine shine and can be worn with Indian as well as Western outfits. Adorn this beautiful jewellery creation to give yourself a graceful look. It will surely enchant any female mind. Flatter your loved one's senses with this exciting range of necklace which comprises triple line black spinel stones arrangement. The sparkling effect of the beads makes this necklace even more beautiful. It is a perfect accessory to go along with any kind of ensemble on all occasions. This vibrant Necklace is traditionally designed and handcrafted. This intricate work alluring jewellery is unavoidably attractive. This is delecately made, displays a fine shine and can be worn with Indian as well as Western outfits. Adorn this beautiful jewellery creation to give yourself a graceful look. It will surely enchant any female mind. 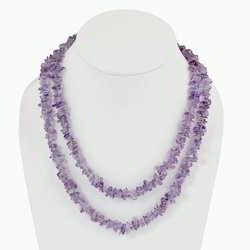 Show your feminine grace with this uncut purple color Amethyst stones mala. It is a perfect accessory to go along with any kind of ensemble on all occasions. This vibrant Necklace is traditionally designed and handcrafted. This intricate work alluring jewellery is unavoidably attractive. This is delecately made, displays a fine shine and can be worn with Indian as well as Western outfits. Adorn this beautiful jewellery creation to give yourself a graceful look. It will surely enchant any female mind. Flatter your loved one's senses with this exciting range of necklace which comprises uncut garnet stones in maroon color with a triple lines arrangement. 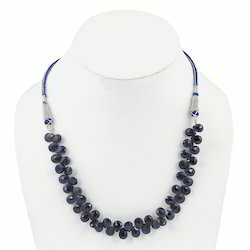 The necklace also has a size adjusting sarafa which comes with the matching colour as the beads. Perfect accessory to go along with any kind of ensemble on all occasions. This intricate work alluring jewellery is unavoidably attractive. Make your Life's special moments unforgettable with this range of designer stones jewellery. This necklace comprises 320 carat green garnets "Savorite" with seven line arrangements. The necklace has a size adjusting sarafa which comes with the matching colour as the beads. Perfect accessory to go along with any kind of ensemble on all occasions. This vibrant Necklace is traditionally designed and handcrafted. This intricate work alluring jewellery is unavoidably attractive. This is delecately made, displays a fine shine and can be worn with Indian as well as Western outfits. Adorn this beautiful jewellery creation to give yourself a graceful look. It will surely enchant any female mind. Flatter your loved one's senses with this exciting range of necklace which comprises 120 carat almond shape blue sapphire stones. The zigzag pattern arrangement makes this necklace unique. The necklace has a size adjusting sarafa which comes with the matching colour as the beads. Perfect accessory to go along with any kind of ensemble on all occasions. This vibrant Necklace is traditionally designed and handcrafted. This intricate work alluring jewellery is unavoidably attractive. This is delecately made, displays a fine shine and can be worn with Indian as well as Western outfits. Adorn this beautiful jewellery creation to give yourself a graceful look. It will surely enchant any female mind. Flatter your loved one senses with this exciting range of necklace which comprises kundan work along with white pearls. The peacock feather shape royal blue stone arrangement makes this necklace unique. The necklace has S-hook which enhances its comfortability. Perfect accessory to go along with any kind of ensemble on all occasions. This vibrant Necklace is traditionally designed and handcrafted. The set comes with two matching earrings too. This intricate work alluring jewellery is unavoidably attractive. It is delecately made, displays a fine shine and can be worn with Indian as well as Western outfits. Adorn this beautiful jewellery creation to give yourself a graceful look. It will surely enchant any female mind. Clinch the attention of the crowd by wearing this Pink Necklace set. The bunch arrangement of the multiple Pink beads makes it charming. The necklace has S-hook closing and comes with two matching earrings too. Perfect accessory to go along with any kind of ensemble on all occasions. This vibrant Necklace is traditionally designed and handcrafted. It can be worn with Indian as well as Western outfits. Adorn this beautiful jewellery creation to give yourself a graceful look. It will surely enchant any female mind. Show your feminine grace with this Red and white multiple pearls necklace. The necklace has S-hook to increase its wearing comfortability. It is a perfect accessory to go along with any kind of ensemble on all occasions. This vibrant Necklace is traditionally designed and handcrafted. This is delecately made, displays a fine shine and can be worn with Indian as well as Western outfits. Adorn this beautiful jewellery creation to give yourself a graceful look. It will surely enchant any female mind. This Semi precious necklace has been made with delicacy of artisans of Rajasthan. This beautiful Zed stone necklace comes in turquoise color oval shape beaded string with sarafa. It will be a perfect accessory to go along with any kind of ensemble on all occasions as it also has decorative kundan work on the faceted beads. This vibrant glittering Necklace is traditionally designed and handcrafted. This intricate work alluring jewellery is unavoidably attractive. This is delicately made, displays a fine shine and can be worn with Indian as well as Western outfits. Adorn this beautiful jewellery creation to give yourself a graceful look. It will surely enchant any female mind. 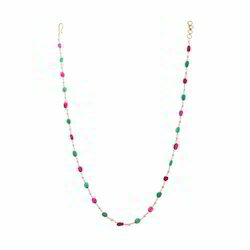 This beautiful necklace comes in glossy Maroon and Green color beads arrangement with the brass chain in the middle. It will be a perfect accessory to go along with any kind of ensemble on all occasions. This vibrant Necklace is traditionally designed and handcrafted. It also has the hook for closing. This intricate work alluring jewellery is unavoidably attractive. This is delecately made, displays a fine shine and can be worn with Indian as well as Western outfits. Adorn this beautiful jewellery creation to give yourself a graceful look. It will surely enchant any female mind. Presenting this exciting range of necklace set which comes with two matching earrings too. This simple and sober necklace is a perfect accessory to go along with any kind of ensemble on all occasions. This vibrant Necklace is traditionally designed and handcrafted. The pendant and the earrings both have pan shape with artistic kundan meena work. This is delecately made, displays a fine shine and can be worn with Indian as well as Western outfits. Adorn this beautiful jewellery creation to give yourself a graceful look. It will surely enchant any female mind. 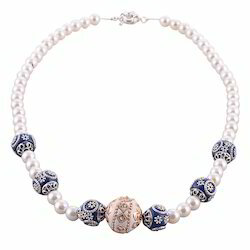 Clinch the attention of the crowd by wearing this fancy White-Blue pearls mala. The shining pearls and spring ring clasp closing make this even more attractive. It is a perfect accessory to go along with any kind of ensemble on all occasions. This vibrant Necklace is traditionally designed and handcrafted. This intricate work alluring jewellery is unavoidably attractive. This is delecately made, displays a fine shine and can be worn with Indian as well as Western outfits. Adorn this beautiful jewellery creation to give yourself a graceful look. It will surely enchant any female mind.